Number of retries when service fails to start: This parameter defines how many time the Service will retry to start the RADIUS server, in case of problems like SQL server not being ready yet. Delay between each retry (in seconds): Number of seconds it will wait between each retry. Interval for maintenance job (in seconds): Evolynx RADIUS automatically executes a maintenance job to do clean-ups and disconnect users whose account has expired, or are out of credit. it also calls a stored procedure which can be customized for your needs. Number of seconds between each execution is set here. Source of Client information: This dropdown allows you to select where you store Client information. By default, Evolynx RADIUS uses SQL database accessed by API to load the Client information. The other option is to use the clients.txt file (mostly used by customized versions of Evolynx RADIUS). Log in Database Also: Check this checkbox to log a copy of the messages to a database table. This allows you to see the logged messages through the Web Admin. 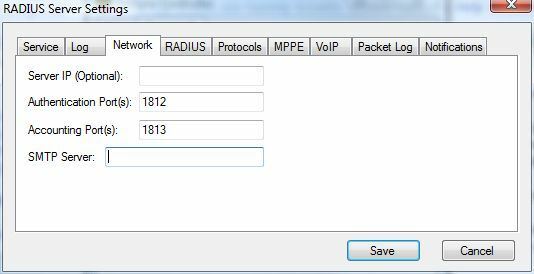 Server IP (Optional): Defines what IP address (from local computer) will be used to listen for RADIUS requests. 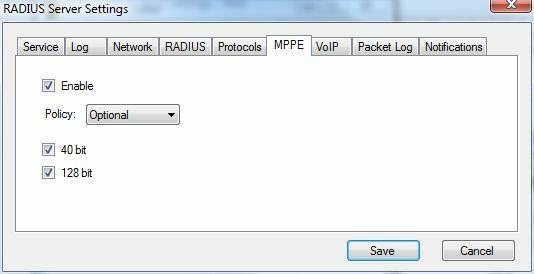 This textbox can be left empty (will use one of the IP addresses), or an specific IP address can be entered in it. Authentication Port(s): A comma separated list of UDP port numbers. Accounting Port(s): A comma separated list of UDP port numbers. SMTP Server: Name or IP address of the SMTP mail server, used to send Notifications. Accounting Interim Intervals (seconds): Determines the expected intervals between Accounting Interim Updates. When set to a value greater than or equal 60, an Acct-Interim-Interval attribute will be sent to the RADIUS Client, instructing it to send accounting interim updates at specified intervals. During the Maintenance job, RADIUS Server will check the connected table and if it finds users (connections) which it has not received an Accounting Interim Update for, in a time period longer than the amount specified here, it will consider the user disconnected and will remove the user from “Connected” table, and will update the user's balance. so RADIUS Clients must be configured to send Accounting Interim Updates for this feature to work correctly. Suggested value for this setting is 600, and a value less than 60 make this feature disabled. Enable Custom Attributes: Works as a global switch to turn the Custom Attribute processing on or off. If you are not using Custom Attributes, you can keep this checkbox un-checked to prevent un-necessary processing. 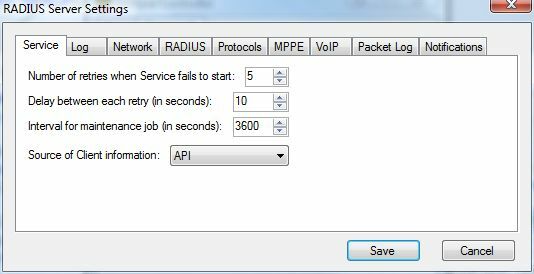 Enable Disconnect Message: Disconnect Message is a special RADIUS packet sent from Server to client to force a disconnect on a specific connection. Disconnect Message is sent either when an Accounting Interim Update is received for a user whose account has expired or does not have enough credit balance, or when Maintenance job find connected users who also fall in the above criteria. Enable “by seconds” Accounting: When this checkbox IS NOT checked, Accounting is done by minutes, meaning all times are converted from seconds to minutes and fees are applied as per minute fees. When it IS checked, Accounting is done by seconds, which means all times are used as seconds and fees are applied as per seconds fees (without being scaled from per minute to per second). You can select which RADIUS attribute should be used as User Name. By default “User-Name” attribute is used to identify the user, but any of the attributes provided in the drop down can be used. Also it is possible to define rules which would change the selected attribute based on the value from any of the supported attributes. This tab allows you to enable or disable Authentications Protocols. MPPE (Microsoft Point-to-Point Encryption) feature is controlled using this tab. Enable: Enables/Disables Microsoft Point-to-Point Encryption. Policy: Specifies if Encryption is optional or required. 40 bit: specifies that 40 bit encryption is acceptable. 128 bit: specifies that 128 bit encryption is acceptable. 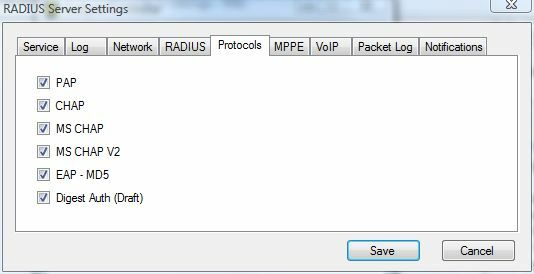 This tab lets you modify VoIP (Voice over IP ) settings. 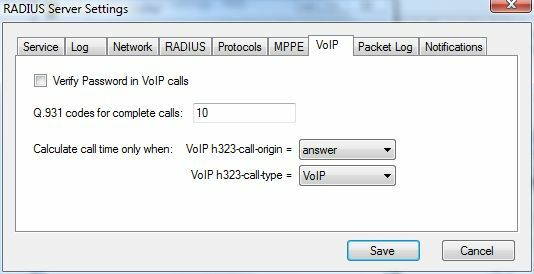 Verify Password in VoIP calls: In a VoIP call, you can choose to authenticate users by verifying their password. 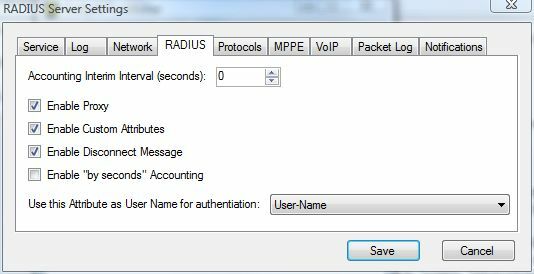 What is passed in the password attribute is decided by the RADIUS Client. In most cases VoIP call is authenticated by the caller ID of the user, so there is no need to verify password. Q.931 codes for complete calls: This is a comma-separated list of Q.931 codes (in hex format) for calls that are considered complete and user is charged for the call. These codes are compared agains h323-disconnect-cause attribute in Accounting Stop packet. For a list of Q.931 codes, see this Wiki page. 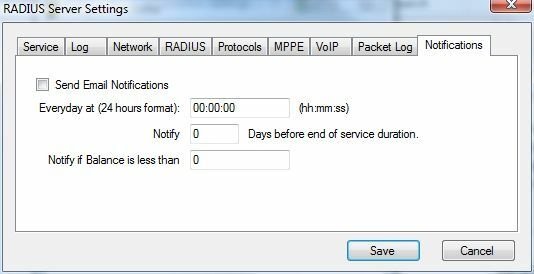 Calculate call time only when: determines which Accounting Stop packet is considered the last chargable leg of the call. h323-call-origin: Determines the start of the chargable call. Has two possible values: originate, and answer. h323-call-type: Determines the type of the chargable call. Has two possible values: Telephone and VoIP. Packet Log feature and its behavior is controlled from this tab. Packet Log lets you store eny number of RADIUS attributes in a SQL server table. 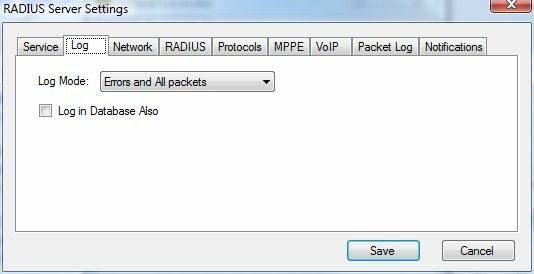 You can select which packets should be logged in the Packet log. 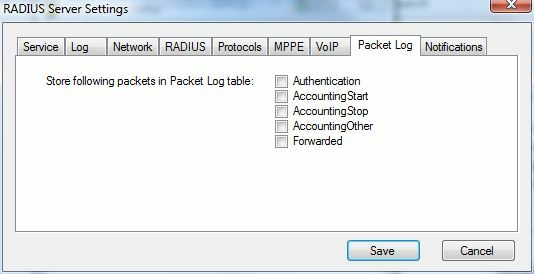 Attributes that are logged in Packet Log can be customized using PacketLogColumns.txt file. Columns with same names must have already been created in the PacketLog table in the database. See Packet Log for more information. This tab controls Email Notifications. Send Email Notifications: Turns all Notifications on or off. Everyday at (24 hours format): Determines time of day in 24 hour (military) format. 00:00:00 means midnight. Notify (x) Days before end of service duration: Will send an email x number of days before account is expired. Negative value means disabled. Notify if Balance is less than: Will send and email if Customer's Balance is less than specified value. Negative value means disabled.